Let's hope that every professional can identify a higher purpose to their work, a purpose that goes beyond simply making a living. Attorneys, for example, might be motivated by a sense of justice. Scientists might view their research as a way to improve people’s lives. Law enforcement officers might feel a sense of duty to serve and protect. History teachers should also sense a higher purpose to what they are doing, not just as teachers, but as history teachers. When trying to identify that higher purpose history teachers should focus on the needs of all students, and they should make sure they are motivated by humane objectives. They should keep the needs of their students and the health of their society in mind. With these goals in mind I present my personal list of ten reason for teaching history. This is not a definitive list and teachers are encouraged to use the list only as a starting point for clarifying their own reasons for teaching history. 1. History provides students an opportunity to develop basic academic skills (reading, writing, and analytical thinking). In the “real” world we may rarely need to know the details of how George Washington persuaded the Senate to ratify the Jay Treaty or how Andrew Jackson destroyed the Bank of the United States. However, we will always need to know how to read, write, and think. Regardless of what our students decide to do with their lives, developing basic academic skills is vital to their success. 2. History helps students better understand the world in which they live. We live in a diverse and complex world, and all of us need to understand that world in order to survive. One of the best ways to understand our world is to understand its history, an understanding that is vital not only to our personal happiness, but also the health our society. 3. History helps students understand human beings and, in the process, understand themselves as individuals. In many ways history is a study of human nature and can help us identify human failures and successes. Since all of us must live with both the vulgarity and the nobility of human existence, we should understand that studying people from the past is one of the best ways to prepare ourselves to live with other human beings, at both their best and their worst. "In history you have a record of the infinite variety of human experience plainly set out for all to see, and in that record you can find for yourself and your country both examples and warnings: fine things to take as models, base things rotten through and through to avoid." 4. History helps students understand people who are different. Learning to think historically requires that we learn to avoid presentism. That is, we learn to study the past by minimizing the biases of the present. To understand people from the eighteenth century we must be able to put ourselves in their world, knowing only what they knew. If we develop this skill successfully we will then be able to understand people from five hundred years ago or two thousand years ago. We will be able to understand people in modern times who live in different nations or grow up in different cultures. 5. History allows students to gain perspective and learn to see a bigger picture. 6. History can inspire students. Most people, at one time or another, need a little inspiration, and what better place to look for inspiration than to dig into the past? History is full of heroic individuals who found something within themselves that helped them overcome tremendous obstacles. We therefore study history, in part, to learn about inspirational people and their triumphs. We can use history to guide us and help us find the strength and wisdom to deal with life’s hardships. 7. History can provide students with a reason for being — it can give meaning to their lives. All of us need a reason for living, a higher purpose to our lives. Are we here primarily to help others or explore new frontiers? Are we here to create and bring beauty into the world? To what extent should we define our lives by our emotional and spiritual development? Is it enough to define our lives by hedonistic desires? All these questions have been dealt with by people who came before us and will help us in modern times find our own answers. 8. History can help students feel a sense of connection. If we consider that an average life span is seventy-five years, it was only two lifetimes ago that it was 1864, and Abraham Lincoln was fighting the Civil War. Only three lifetimes ago it was 1789 and George Washington had just become president. History helps us understand how closely we are connected to the past. 9. History is entertaining and fun. History is full of drama, suspense, mystery, romance, tragedy, and comedy. If we let the facts speak for themselves, students will likely find great entertainment in stories from the past. 10. History provides students time to wonder and dream — it gives them an opportunity to imagine a better future for themselves. History leads us to a place where we better understand each other and the world we live in. This understanding can help us then imagine a better way to live and give us the ability to pursue our dreams while staying grounded in our knowledge of the past. "To me, history ought to be a source of pleasure. It isn’t just part of our civic responsibility. To me, it’s an enlargement of the experience of being alive, just the way literature or art or music is." "Imagination is the ability to bring to mind things that aren’t present to our senses. With imagination you can revisit the past. Indeed you have a past. It is the root of historical study. What history teaches is that the past is not settled. It’s not a closed account. It’s a vibrant, fertile place that’s open to constant reinterpretation. With imagination you can visit other people’s point of view. You can empathize with their life. You can empathize with how they see and feel things." Before history students open a textbook, memorize a date, or write a thesis statement, they should understand what they will be learning and why they will be learning it. Students don’t necessarily come to school looking forward to learning history, and unless they understand the importance of what they will be studying, they will likely put little effort into learning it. I have listed seven questions below that I hope will lead students toward a better understanding of the historical process and why it matters to learn that process. I make no claims to having profound answers to the questions. I only ask that history teachers use this information to spark their own thinking and develop their own answers, possibly even adding new questions. History is a story created from an examination of the recorded past. 2. Why is history defined as a “story"? When we study history we don’t necessarily learn what happened — we learn a “story” about what happened. History might not always move forward in a linear fashion with clear beginnings and endings that can be divided into distinct chapters. Even so, historians often explain the past with stories divided into chapters so that it makes sense. The historical process requires historians to compartmentalize and categorize information into a variety of topics (or chapters). Otherwise, the past might appear chaotic. It might help to think of historians as detectives. They gather evidence about something that happened and then hope they can recreate the past in a way that persuades people to accept their version beyond a reasonable doubt. Like detectives, historians might never know for certain whether they have accurately recreated what happened. The best they can do is create a narrative that conforms to the evidence available to them. They also understand that different detectives/historians might provide different narratives, even when they have examined the same evidence. If several people witness a crime, for example, investigators might hear several versions of what happened. Even if they have a film of the crime, they might interpret what they see in the film in different ways. Over time, investigators might even gather evidence that discredits eyewitness accounts, leading to entirely new versions of the story. In short, the job of historians, like crime investigators, is to reach rational conclusions based on the evidence available to them and then create a narrative from that evidence. For the narrative to make sense, historians must compartmentalize and categorize information, and whenever new evidence emerges, they must be willing to reevaluate their conclusions and change their narrative. And that’s the historical process. Students should understand that history requires them to tolerate uncertainty. They can never really know what happened. They can only examine the “stories” created from available evidence. Everybody likes a bit of gossip to some point, as long as it’s gossip with some point to it. That’s why I like history. History is nothing but gossip about the past, with the hope that it might be true. 3. What is meant by describing history as the "recorded" past? If we have no records from the past, we quite simply have no way of knowing what happened. Historians look at a variety of artifacts and documents to create their stories of the past. They study letters, diaries, paintings, photographs, music, old clothes, cooking utensils, weapons, garbage, and much more. They might even study natural phenomena, looking at the geographical features of where people lived or the significant natural events that might have affected their lives. All told, trying to tell a story about what happened in the past requires historians to assemble a puzzle from many different pieces of evidence. Even when the picture is seemingly complete, a new piece of the puzzle can cause the historian to see an entirely new picture and revise the story they had always told. Some pieces of the puzzle might be lost forever, and the historian might never know the entire story about something that happened. Like detectives, historians have problems to solve. They ask questions about the past and then look at artifacts to create a narrative to answer those questions and describe what life was like for people living in a bygone era. 4. Why do we wonder about a world that no longer exists? We wonder about the past because we cannot help ourselves. We read an old letter and wonder about the person who wrote it. We look at an old stove and wonder what type of food people cooked on that stove. We look at our system of government and wonder how it developed. We see our friends and colleagues on Monday and ask them what they did over the weekend. Questions about the past are ever present in our lives. History might also help us understand what is eternally true about being human. It might help us understand ourselves as individuals and the world in which we live. History helps us see a bigger picture of how human beings once lived and how our lives fit into that picture. It’s only natural to wonder how much our world is the same as the world of the past, as well as how much it is different. 5. How does history help us understand today’s world? All of us are products of the world in which we live. If we had been born in a different time and place, we might speak different languages, eat different types of food, wear different types of clothes, adhere to different social customs, and follow different religions. Much of who we are and what we think is a product of our time and place in history, and the distinct character of our time is a product of thousands of years of history. Americans in today’s world, for example, ask different questions about the past than Americans of the 1890s, 1930s, or 1960s. Additionally, the questions that Americans ask about the past are probably much different from the questions people in China or Russia ask about their past. In short, history is a dynamic, ever-changing, and often contentious subject. The study of history is a powerful antidote to contemporary arrogance. It is humbling to discover how many of our glib assumptions, which seem to us novel and plausible, have been tested before, not once but many times and in innumerable guises; and discovered to be, at great human cost, wholly false. 6. How does the dynamic nature of history affect the stories we tell about the past? Our stories about the past are always changing. The story of the American Civil War that people heard in the 1930s is different from the story told today, and the story that is told 80 years from now will be different from the story we tell today. History is not necessarily what happened, it is a story about what happened, and the way we tell the story keeps changing to accommodate the time in which we live. Not only does the time in which we live shape the story, the place we live also affects the way history is told. Americans tell a much different story of the American Revolution than the British. The Vietnamese tell a much different story of the Vietnam War than Americans. The challenge for all of us is to become bigger than the time in which we live. 7. What does it mean to become “bigger” that the time in which we live? Studying history provides us with the bigger picture of our lives. We are able to see how our lives compare to the lives of the billions of people who came before us. The more we understand about the people of the past, the more we can understand ourselves. History gives us a much greater perspective on our world and our place in it. And there is no reason we must remain prisoners of the modern world. We can learn to think beyond our lives and imagine a better world. Like Americans who knew slavery was wrong while living in a world that accepted slavery, we can put ourselves on the right side of history. We can imagine a better and more humane world to come. We can be “bigger” than the time in which we live. Several years ago I was asked to write an article about the similarities between between teaching and acting. The article, originally titled "You Are Who You Pretend To Be," was published in the second edition of Acting Lessons for Teachers: Using Performance Skills in the Classroom by Robert T. Tauber and Cathy Sargent (Praeger, 2006). With a few minor revisions to update the original version, here's a copy of the article and its tribute to Frank Dooley, a master teacher who left an indelible mark on a multitude of New Mexico math students and basketball players. My high school math teacher did not tolerate foolishness. His class was designed to help students learn, and he used time productively. He had a sense of humor, but his humor was geared toward the task of learning algebra. He could tell good stories, but the stories led to a math problem that needed solving. He was relaxed, but his students never wasted time. I knew to show up ready to learn or confront his disapproval. I felt compelled to do my best because I knew he would never accept a second-rate effort. I am no longer be able to solve the algebra problems I conquered in Mr. Dooley’ class. I am certain, however, that if my studies in math had continued in college, I would have been prepared for success. After all, I had a great math teacher in high school. Mr. Dooley not only taught me to solve algebraic equations, but also to take learning seriously. He made sure I excelled at every task. The fact that Mr. Dooley was able to make such a difference in my life — and in the lives of many other students — came from something intangible. His success did not come from the textbook he used or the teaching strategies he learned at a university. He was a successful teacher because of who he was as a person. Indeed, it may be that the secret to good teaching is found in one simple idea: Good teaching stems from good people. Students will work hard for a teacher they respect. Students know whether a teacher is in the classroom for reasons of the heart. They know whether the teacher loves the subject and has faith in students. If students sense that a teacher is working hard for their benefit, they are more likely to put a little extra effort into an assignment. They are more likely to try to learn something new. Mr. Dooley was such a teacher. Students sensed that if they did what he said, they would succeed. Students sensed he was on their side. When I was in high school, I thought of Mr. Dooley as a mythical figure, a character larger than life. He was the basketball coach at my high school and had already won several state championships. Even so, I now realize something I would never have imagined in high school — Mr. Dooley was just a man, a human being like the rest of us. After spending thirty-five years as an educator, I now understand that the mythical teacher who inspired me to do my best was in large part a role assumed by a man who understood the responsibilities of his profession. Teachers, like actors on a stage, assume a role to play. Mr. Dooley played his role well and, in the process, helped many students. Success for a teacher depends, in large part, on the role the teacher plays in front of students. Can the teacher inspire students and ignite flames of curiosity? Is the teacher the type of person who challenges students to do their best? Good teachers, like good actors, know they must create a well-defined character for an audience. Good teachers also know that teaching demands full immersion in the role they are playing. The teacher must continue to play the role in the hallways between classes, at the Saturday night basketball game, and when running into students at the mall. After all, it might not be what a teacher does in the classroom that most affects a student’s life. It might be the words a teacher speaks while talking with someone at the grocery store or in the waiting room at the dentist’s office that inspires that person to work a little harder or be a better person. Teachers might even find themselves playing a role in front of a former student several years after the student has left the classroom. New teachers must be aware that once they enter the classroom their profession will require them to play a role. Whether in the classroom or at the department store, teachers have a deep and profound responsibility to serve the needs of their students. Teachers have an ethical obligation to find a way to inspire their students, and they must never abandon that obligation. Success as a teacher demands that the character a teacher develops must seem authentic to students. In the same way that a movie audience can spot a bad actor in the first reel, students can detect a fraudulent teacher on the first day of school. Teachers must therefore draw on the imagination of an actor to capture a sense of authenticity in the role they play. Students know whether their teacher is dedicated to the profession or is just marking time until the bell rings at the end of the day. Teachers, like actors, must find elements of their own personality in the role they are playing. Teachers must find the part of their spirit that wants to help students and then bring that spirit into the classroom. They must accentuate the part of their personality that is honest, caring, and full of love. They must shine a spotlight upon the part of their soul that wants to give students a bright future and make the world a better place. As Kurt Vonnegut said, “Be careful what you pretend to be because you are what you pretend to be.” Teachers who might be distracted by circumstances in their personal lives must pretend to be focused on the concerns of the students. Teachers should hope that no matter where students end up after leaving school they will always remember their teachers as the people who never gave up on them. Teachers are human beings, and they make mistakes. Like anyone else, a teacher might not always be the person he or she would like to be. Every teacher should try, however, to pretend to be the person who motivates students. Every teacher should try to act the part. Even if a teacher has played the part for several years, he or she can assume the attitude of a good actor and know that this year’s students have never seen the performance. Each teacher must play the part well. Nothing more than the success and well being of children is at stake. For me, nobody played the role better than Mr. Dooley. Note: One of Bill Richardson's last proclamations as Governor of New Mexico was to declare November 15, 2010, as "Frank Dooley Day." That said, I’m not hesitant to claim expertise in one aspect of teaching — survival. I lasted long enough in the profession to collect a retirement check, and I left with my love for teaching intact. Based on my ability to make it long enough to retire, I have developed a few suggestions for surviving in the profession. The list is by no means complete. It is simply a list of a few things that worked for me. For teachers who are looking for a little pat on the back and a few words of encouragement, here’s my recommendations for surviving in the teaching profession. 1. Never enter a classroom unprepared. To various degrees all teachers confront bad behavior in the classroom, and even the best teachers must occasionally deal with a “student from hell.” However, a teacher who can keep a classroom under control is a teacher who can survive. In my experience the best classroom management plan is a good lesson plan, a lesson plan that engages students. Teachers who do this well are generally able to guard against behavior problems before they develop and put themselves in a position to enjoy the rewards of teaching. 2. Find a way to motivate and inspire students. Teachers should do everything they can to light a fire under their students. Teachers who can inspire students are also the teachers who are inspired to remain in the classroom. 3. Never quit learning and growing as a teacher. If something can't grow, it dies, and survival as a teacher requires the ability to avoid getting stuck in a rut. Keep learning. Keep growing. Talk to other teachers, and observe them in action. Ask how they create lesson plans and how they deal with classroom management. Attend workshops and conferences. An inexperienced teacher can learn a lot from someone with a few years in the classroom, and an experienced teacher might even learn something worthwhile from a first year teacher. In any case, all teachers should exercise their ability to change what they are doing in the classroom. 4. Bring a sense of playfulness into the classroom. In a perfect world, learning for the sake of learning would be enough to make a class enjoyable. However, teachers might sometimes need to resort to something a little more entertaining — corny jokes or silly costumes, for example. Teachers are more likely to remain in the profession when they find a way to have fun, and the best way for teachers to have fun is to find a way for students to have fun. 5. Have faith in youth. Teachers are not served well by remaining ignorant about the things that interest young people and letting a generation gap make them cynical about the behavior of the young. Teachers should have faith in youth and believe in the potential of youth. They should let their faith in youth translate into a faith in the future and their faith in the future translate into a faith in humanity. Teachers who maintain this faith will not find it difficult to survive in the classroom. 6. Maintain an idealism about the profession. Teaching is a noble profession. No less than the success of each student and the health of our nation depends on how well we educate our youth. Most teachers enter the profession with an innate sense of the higher purpose of the profession, and they should not let that idealism disintegrate. Idealism about the profession feeds the spirit and helps a teacher survive in the profession. That age-old saying (author unknown) describes the serious problem of teacher burn out. Teaching is a difficult job, to say the least. Students, parents, administrators, community organizations, and politicians often demand more than teachers can possibly achieve, and teachers must work hard to avoid losing heart. Good teachers are one of the most valuable resource in any society — if not the most valuable resource. To keep from losing heart, teachers should learn to savor the rewards of the profession and stay focused on the needs of children. 8. Find a hobby outside teaching. All good teachers face the problem of being consumed by their work. Evenings and weekends are spent creating lessons, evaluating student work, or sponsoring student organizations. Vacations are spent going back to school, working on curriculum, or attending workshops. If teachers do not routinely get away from their jobs they face burning out. They must therefore find something outside the profession that engages their interest. They must get away from the stress that comes with teaching. They must take time to play a musical instrument, read a novel, join a book club, go hiking, listen to music, attend a play, go to the movies, remodel a home, join a sports league, or go fishing. They should find something that allows them to turn off the problems that come with teaching, problems that might push them into losing their desire to remain in the classroom. 9. Maintain a sense of humor. The author Richard Carlson once wrote, “Don’t’ sweat the small stuff — and it’s all small stuff.” That might sound like clever advice. However, Carlson was probably not a public school teacher and was not vulnerable to issues that would horrify, frustrate, and break the heart of even the most lighthearted soul. Any teacher who has known a student suffering from terminal cancer or a student who fires a gun in school knows that it’s not all “small stuff.” Indeed, the only way to handle some problems is to go home, lie in bed, and weep. On the other hand, Carlson was right in one sense. Many of the frustrations teachers face amount to nothing more than little things that are best handled with a sense of humor. For example, most of the day-to-day, time-consuming, dumb requirements from administrators can be completed without taking them too seriously. After all, administrators change their stripes every year or so. This year’s administrative crusade might be abandoned next year. Experienced teachers learn to play along with “administrivia” just enough to keep administrators happy — then they do what’s right for students. In addition, most of the childish things students do to aggravate teachers should be put into perspective and handled with a sense of humor. Children often act immature simply because they are children. Good teachers know this and learn to handle childish behavior with a smile. Most teachers get into the profession for reasons of the heart, and more than anything else it’s the students who feed the heart of the teacher. Students nourish the teacher’s spirit. Students make all the heartache and stress worthwhile. Students are the best fringe benefit of the profession, and teachers should always keep this in mind. As a teacher in lifelong learning programs, I am not required to create tests, grade papers, or fill out evaluations. Students enroll in classes simply to learn for the sake of learning. Needless to say, the classes are a joy to teach. I had become accustomed as a high school teacher, to the constraints place on teachers from standardized testing, curriculum benchmarks, administrative trivia, and classroom disruptions. Teaching in lifelong learning programs, however, has given me a different perspective on what it means to be a teacher. When I teach a lifelong learning class, I am teaching in what I have to call an “uncorrupted” classroom — all that matters is learning. My sole responsibility is to create worthwhile lessons that engage students. Here's what becomes crystal clear when all the obstacles I faced to teaching in a public school are removed. 1. The best way to learn a subject is to teach it. I have three university degrees and have been teaching history for over forty decades. I majored in music as an undergraduate and have spent decades reading about music, studying scores, listening to music, and teaching music to high school students. My experience and résumé should show that I am qualified to teach music history to lifelong learners. Why, then, do I spend so much time preparing to teach my classes for lifelong learners? I have always felt an obligation never to waste my students’ time. I want students to feel that I have a well-defined purpose in how I present information and that I am providing them with worthwhile lessons. I want students to feel I can answer questions or provide advice on where they might find answers on their own. Quite simply, I want students to believe that I know what I am doing. I cannot achieve these objective unless I have mastered the subject I am teaching. Mastering the subject — knowing my stuff — liberates me to be flexible in how I deliver lessons. It helps me to know how to cover material efficiently. Only when students sense that I have forgotten more about the subject than they have yet learned, I am then qualified to teach the class with integrity. 2. Students are not the only ones in the classroom trying to learn. Experience has taught me that I often learn more from students than they learn from me. Students make comments or ask question that force me to reevaluate my knowledge of a subject or how I might change my approach to teaching the subject. This has been true whether I am teaching high school students or lifelong learners. For me, teaching is a process of constant self-evaluation. I am continuously monitoring what I do in the classroom and making adjustments, running my knowledge and skills through a gauntlet of questions and comments and seeing what remains when the process is over. In most cases, I come out the other side knowing more than when I began. For the process to work, I must teach in a way that inspires the comments and questions that can help me gain a better understanding of the subject and how to teach it. Students should not be the only ones in the classroom learning something. 3. Teachers must find a way to connect the subject they teach to the lives and welfare of their students. Effective teaching requires a teacher to make a subject relevant to the real world and the lives of their students. If not, the teacher’s lessons will fail to engage students, and everyone in the classroom — teachers and students — might as well be somewhere else. Sometimes, when students are not motivated to learn, their lack of motivation comes from being unaware of how the subject is relevant to their lives. Teachers must therefore be abled to explain the wisdom of learning the subject. If students are not motivated, the teacher must work hard to find something that will motivate them. Even when teaching the self-motivated students I find in lifelong learning programs, I must choose information about music history that is worth knowing and make clear the reasons it is worth knowing. I must present the information in such a way that students understand the wisdom of learning it. Explain a subject well, and it will engage the attention of the student. Explain the wisdom of learning a subject — even if it is only learning for the sake of learning — and students will do all they can to master what they are taught. I should say that I am not an idealist on this issue. I spent a long time teaching in a public high school, and I know all too well just how hard it can be to motivate some students. Even though motivating certain students might be impossible, it’s still the job of the teacher to do everything then can to find something that works. 4. Teachers must have faith in their students and believe that every student can learn. All good teaching stems from the belief that every student can learn. Indeed, I cannot be an effective teacher if I stand in front of classroom believing that some students will just never be able to learn what I am teaching. Whatever it takes, I must find a way to reach every student, to present the subject in a way that students who are having trouble will eventually understand what I am teaching. Considering the types of students I teach in lifelong learning programs, it might seem that I don't need to pay much attention to this element of teaching. I suspect, however, that when I try to point out the main themes in the exposition at the beginning of Beethoven’s Symphony No. 3, some students may not be able to hear what I am talking about. I suspect that when I point out how those themes are developed and how everything that is happening in those themes relates to what Beethoven is trying to say metaphorically throughout the entire symphony, some students might not be able to understand those metaphors. Nevertheless, I will keep working at finding a way to explain the subject so that it makes sense. I will search for new ways to explain it. I will ask other students if they can explain it. Whatever happens, I will never give up. Whatever it takes, I will find a way to help all students learn what I am trying to teach. 5. A teacher's ability to inspire students is more important than the factual knowledge the curriculum requires. Music students need to be taught the correct way to form an embouchure, hold an instrument, count rhythms, and phrase musical passages. However, if music students do not spend time alone, practicing their instruments, a teacher’s lessons are a waste of time. In the end, students are responsible for their own education. The job of a teacher is to guide them and do what is necessary to inspire them to learn on their own. I often think about this element of teaching while preparing to teach lifelong learning classes. Although I must try to know all I can about the subject I am teaching, it is more important that I teach in a way that students are motivated to spend more time learning the subject on their own. I must make the subject so interesting that what students learn from me will not be enough. Lifelong learning students generally come to class motivated to learn, but will I be able to keep them motivated? Will I make them want to return to class next week? Will I make them feel the class is worth their time? In the end, if I have not motivated students to learn more on their own, I will have done little that really matters. I understand that my experiences with lifelong learners are not the normal situation for most teachers. I am simply trying to make a few comments about what it means to teach in an ideal, or uncorrupted, classroom. I am also hoping to shine a light on how easy it is to corrupt the environment necessary for good teaching — and therefore learning — to take place. The type of teaching I have described above can easily be corrupted by the actual situation confronted by most teachers in the public schools. In a public school, a single student’s bad behavior can subvert all the work a teacher has done and keep thirty other students from learning. Overcrowded schools and classrooms make it difficult for a teacher to determine the individual needs of students. Constant interruptions by administrators, teachers, students, parents, and community members break the flow of well-developed lessons. Inflexible benchmarks geared toward standardized testing and dictated from outside the classroom often keep a teacher from adapting to the various abilities and needs of their students. Paperwork for teachers can be so overwhelming that time for creating good lesson plans is lost to administrative requirements. Teachers then easily spend more time serving administrators than students. The problems I confront teaching lifelong learning classes are obviously much different from what I faced as a high school teacher. However, I believe that what I have learned teaching lifelong learners applies to much more than teaching self-motivated and mature students. What I have learned teaching in an uncorrupted classroom should be relevant to all teachers. At any grade level, teachers should know their subject well and be willing to keep learning. Teachers should be able connect what they teach to the lives of their students and believe that every student can learn. No teacher should ever give up trying to motivate and inspire students. I have also learned that public schools should do more to eliminate the things that corrupt the learning process. Public school administrators should do more to reduce the demands made on teachers that take time away from preparing good lessons and serving students. They should do more to trust the professionalism of teachers and allow them to adjust their curriculum and lesson plans to fit the needs of students. They should do more to create an environment in which good teaching can flourish. I understand that we cannot turn our public schools into lifelong learning programs. However, what I have learned teaching in those programs has confirmed my belief that we can do much more to get out of the way of our teachers and let them teach. We can do more to liberate teachers from the distractions that do not serve the needs of students. We can do more to get rid of the things that corrupt the process of teaching. In regard to improving public schools, I propose that less is more. Fewer administrative demands made on teachers will lead to a better learning situation for children. Doing nothing for others is the undoing of ourselves…. We do ourselves the most good doing something for others. Teachers merit great admiration for having the courage to place themselves in the trenches of public education and do something every day to serve children. Teachers are indeed a special breed and deserve nothing but the highest praise. And their work is not easy. Considering the extraordinary demands placed on teachers, I find it remarkable that teachers achieve as much as they do. At times, I wonder how anyone can do the job. As an illustration, let me offer a description of my own experiences as a teacher. Although I am no longer teaching in a public school classroom, the memories of the pressure that accompanied the job will remain with me forever. Upon driving into the parking lot every day at 7:15 a.m. (or earlier) I always took a deep breath and braced myself for the stress that would define the next ten hours. Throughout the day I found myself juggling several tasks at once. Before school I tried to complete administrative paperwork while students surrounded my desk. Every student needed something from me and every one of them seemed to talk at the same time. As students asked me questions, I sat at my desk with piles of paperwork in front of me, paperwork that included various types of administrative trivia: forms for students needing special accommodations, surveys or inventory for administrators, and progress reports for parents and counselors. While trying to process several demands at once, my mind was also reviewing my lesson plans for the day. I'm not sure how I kept everything straight. I kept yellow sticky notes scattered around my desk with reminders of everything I needed to get done, but in the constant confusion I often couldn't keep track of the sticky notes. And the stress never let up. During the school day I found myself standing in front of each class facing thirty-five adolescent personalities, each one needing my attention and an affirmation of their self-worth. While trying to provide students with their individual and group needs, I was forced to deal with constant interruptions from intercom announcements, students needing to leave class and a steady stream of people knocking on the door — students, teachers, and administrators. I often felt forced to teach between the cracks. Finding time to go to the restroom was a luxury. I would try to go between classes, only to have my walk down the hallway interrupted by many of the students, teachers, and administrators I passed on the way. Again everyone seemed to need something from me, and if they asked me for something as I walked down the hallway I might later forget what they wanted because I didn’t have a sticky note to write it down. Sometimes I never made it to the restroom before the next class began. If I wasn't in my classroom helping students during the all-too-short lunch period, I would find myself nursing a sandwich and a bag of potato chips in the teacher’s lounge while I listened to other teachers grumble about administrators and the educational system in general. I would then return to my classroom for my afternoon classes, awash in the gloominess of the teacher's lounge. For me, the so-called planning period placed in our daily schedule never seemed long enough to complete the unfinished administrative tasks that had built up during the day. My planning time was almost always occupied by completing paperwork or going to meetings with special education facilitators, counselors, administrators, or parents. Too often, I had no time to plan lessons for my own classes, much less get any papers graded. Quiet time to gather my thoughts at school was nonexistent, and during my evenings at home I was often too tired to do much more than take a nap in front of the television before I began grading papers or creating a lesson plan for the next day. Teaching was not a job I could leave behind once the workday was over. From what I have heard in the professional development workshops I have been leading over the last 18 years, my experiences as a classroom teacher seem to be shared by all public school teachers. It has been estimated that 40 to 50 percent of teachers leave the profession within the first three years, and I understand the reasons people leave. Teaching is a demanding and stressful job — to say the least — and I have not even mentioned the sometimes unruly students that often magnify the stress. I have also not mentioned the inadequate salary that has forced many teachers to seek part-time jobs so they can pay the bills and support their families. None of this, however, is meant to discourage young people from thinking about a career in teaching. Many careers have a high level of stress, and many jobs are ultimately full of frustration. Teaching, however, can often be quite a fulfilling profession, a job that can make you feel you have done something worthwhile with your life. Teaching is a vitally important profession. I’ve heard school described by an elementary student as "The Big Chance.” Education provides opportunities for children in their personal lives, and no less that the health of our society depends on how well we educate our children. Everyone dedicating themselves to improving the world by becoming a teacher should be able to sleep well at night knowing they have done something to help others. If any prospective teachers are reading this blog, I recommend that you take the leap but do it with your eyes wide open. It won't be easy, but your nation needs good people willing to place themselves in the trenches and make a difference. Yes, teaching is stressful and the pay is not great, but the rewards are plentiful. I would like to thank all teachers for the sacrifices they make. Hang in there, and keep working hard. In the end, you just might win a few victories for humanity. As an undergraduate, I was enrolled in an American literature course at New Mexico State University taught by Marion Hardman. Dr. Hardman was a legendary teacher who left a legacy that continued long after she was gone. She was a master teacher and remains, I am sure, the best literature teacher her students ever knew. 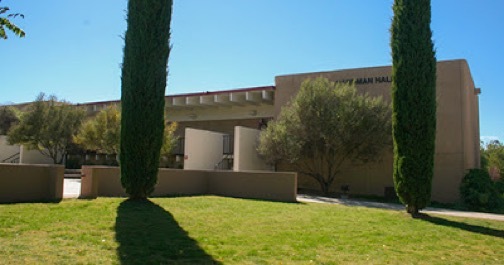 She taught at NMSU for 40-plus years and had a building named in her honor while she was still teaching. The class I took under her tutelage was on the second floor of Hardman Hall and was the last class she taught before retiring. I assume the students who shared that class with me remember her final lecture. For me, it was a life-changing event, and I still have my notes from what she said. During that last lecture Dr. Hardman gave an account of how she first came to NMSU. She talked about the problems she faced as a young woman at a conservative agricultural school in the 1930s. It was fascinating to hear her talk about her career at NMSU, a career that would inspire feminists and scholars of both sexes. She talked about her intellectual development. She talked about meeting Ernest Hemingway. She warned against the movement to make learning “useful” and “relevant.” For Dr. Hardman, education was about much more than simply preparing students for a career. She thought education should help students tap into something eternally true about being human. She felt students should examine the wisdom of the ages and understand their lives in the context of the entirety of human experience — art, history, literature, music, philosophy, and science. After requesting that all of us listening to her last lecture commit ourselves to learning for the sake of learning, Dr. Hardman lamented a headline in a local newspaper stating that NMSU students “learn to earn.” She advised us to recognize the triviality of that headline and instead explore our innate desire to live a good life through discovering the pleasures of learning for the sake of learning. Dr. Hardman believed an education should nourish the intellect and feed the soul. Her words have inspired me throughout my teaching my teaching career. That quote comes from a Spirit magazine headline for a 2011 article about America’s Best Teachers, and I share the quote via T. Nick Ip’s book, Teacher Top 5. Ip spent fifteen years in finance and strategy before becoming an elementary school teacher to “find the poetry in his life.” Ip’s book, which is obviously a labor of love, has certainly found the poetry in those who have dedicated their lives to teaching. Teacher Top 5 profiles twenty-five nationally recognized teachers and their Top 5 strategies for successful teaching. The book includes chapters on teachers who have been recognized as members of the National Teachers Hall of Fame, National Teachers of the Year, State Teachers of the Year, and numerous other awards. Each chapter in the book profiles individual teachers, exploring their backgrounds, their reasons for becoming a teacher, their desire for changes in the educational system, and, of course, their Top 5 recommendations for successful teaching. The book should serve as a guiding light for young teachers and experienced teachers looking to revitalize their careers. Public education might also be well-served by placing Ip's book in the hands of administrators and policy makers attempting to standardize and centralize how good teaching should be measured. Standardization and centralization of curriculum are destroying the art of teaching and strangling the creativity and innovation that allows good teaching to thrive. I hope that people making educational policy would recognize this after reading Ip's book. As the book makes clear, the nation's best teachers went into the profession for reasons of the heart, and they certainly remain in the profession for reasons of the heart. Policy makers might learn from Ip's book how they can avoid cutting the heart out of the art of teaching. Ip’s book is accompanied by a website at www.teachertop5.com, which contains information about teachers profiled in the book. If you are a teacher, you can also share your Top 5 strategies for successful teaching and possibly be featured on the website.